You’ll feel like you’ve gone back in time when stepping into Chez Paul. This popular restaurant near the Bastille is filled with vintage elements that deliver a homey, comfortable atmosphere. The food is also elegant, comfortable cuisine. Chez Paul serves solid, traditional French cuisine. As such, you’ll find many more meat options than vegetarian. There’s not much on the menu for the vegans. It’s a shame, as the food is really amazing. I visited Chez Paul on a Friday night. A reservation is highly recommended, as this is a popular restaurant in a popular dining area. 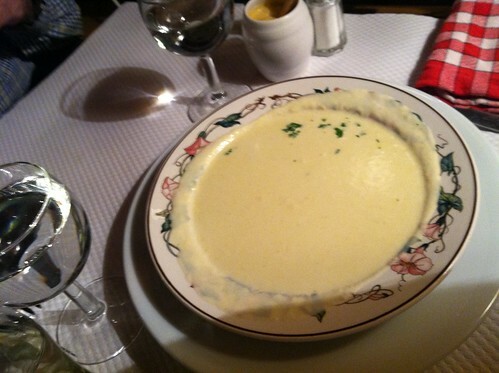 I started with the cream of asparagus soup, which was amazing. It was silky and very satisfying. Frankly, I could have stopped at just the soup and died a happy man. 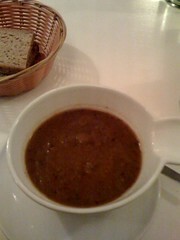 Chez Paul features a special vegetable soup every night, so hopefully you’ll be arrive on asparagus night. 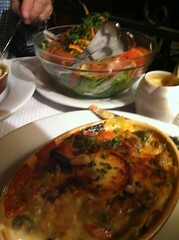 Following the soup, my friend Bob and I had the vegetable lasagna and salad. The lasagna was good and cheesy, but didn’t match the asparagus soups flavor quality. Finishing the night, I had the house specialty dessert: pears poached in a spiced wine with ice cream. This was also an amazing dish. To summarize: Chez Paul is a fantastic, vintage restaurant in a hip section of Paris. The food is amazing, but the vegetarian selections are limited. The vegan options are even fewer. It’s a fabulous place to visit with friends. Accessibility: Only a portion of the restaurant is wheelchair accessible. Restrooms are not accessible. I just noticed that La Victoire Suprême du Cœur has changed owners. This news came courtesy of the blog Vegan Paris. The restaurant has changed names and now features non-vegetarian items. Fortunately, they still have the same kitchen staff, so there should still be some good options for vegetarian diners. 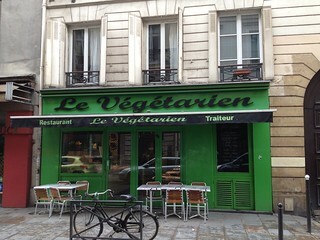 There is one bright side: the new restaurant is run by the same “équipe,” who were always fairly well informed about what ‘vegan’ means, and the menu is clearly labelled with several vegetarian and vegan options. Also, they have vegan desserts. La Victoire was a high-end vegetarian restaurant in the Marais district. I’d been there a few times and enjoyed the variety of dishes.